One theme I have always loved is the civilization building genre. I have loved the Civilization series of video games since I was a kid and I have enjoyed the theme in board games. The one problem with the civilization theme though is that it usually doesn’t translate well into simplistic quick games. Most civilization building games are somewhat complicated and take time to learn. It is also hard to find a civilization game that takes less than an hour to complete. The simplicity and quickness are the two things that interested me most when I heard about Civscape. In its’ goal to make an easy to play and yet fun civilization building game, Civscape succeeds for the most part. Setup is dependent on how you choose to play the game. If you want to play a scenario, special setup rules are used. 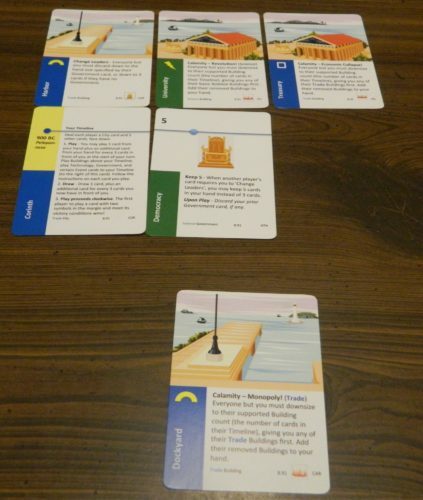 Otherwise you can use the entire deck of cards or you can choose to just use the cards associated with the cities that players are using in the game. Each player chooses which city they would like to play as and takes the corresponding city card. Each player places this card in front of them which starts the player’s timeline. The non-city cards that are going to be used in the game are shuffled and each player is dealt five cards face down. The player who is using the oldest city gets to play first. A player begins their turn by playing a card(s). Players can choose to play zero cards on their turn. If a player wants to play cards, the number of cards they can play on their turn depends on how many cards they currently have in front of them. For every three cards in front of a player they are able to play an additional card. For example if you have two or less cards in front of you, you can only play one card. If you have three to five cards you can play two cards, etc. When a card is played it will either be played to the player’s timeline in a line extending from the player’s city card or to the player’s skyline which is a row of cards played above a player’s timeline. The location where a card is played is determined by what type of card that it is. 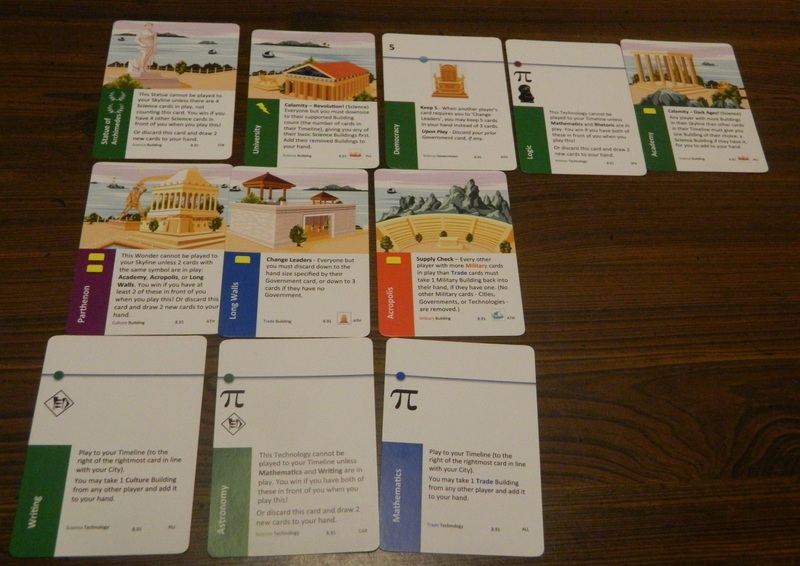 The bottom row of cards is the player’s timeline. The top row is the player’s skyline. There are basically four different types of cards in Civscape. 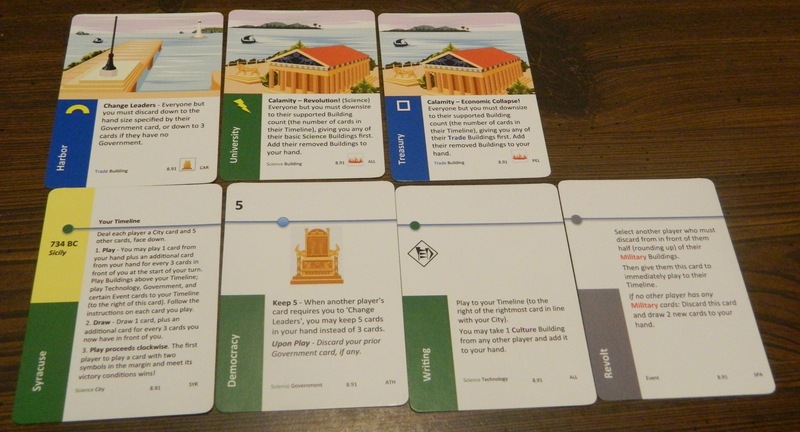 Buildings: Building cards are played to a player’s skyline. Government: Government cards are added to a player’s timeline. Only one government card can be in a player’s timeline. If another government card is played it replaces the government card already in play. This player has played the Diarchy government card. This card allows the player to keep 10 cards in their hand each time the change leader effect comes into play. 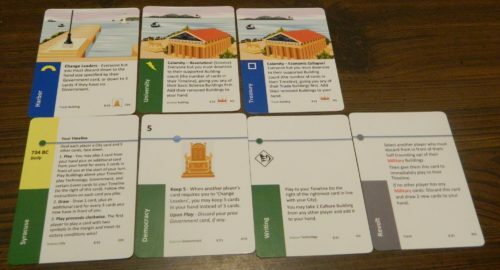 Technology: Technology cards are added to a player’s timeline. Events: Some event cards are played for their effect and are then discarded while others are added to a player’s timeline. Calamity: When a calamity effect goes into play all players must give the player who played the card one of their building cards from their skyline if they have more building cards in their skyline than they have timeline cards. If the calamity effect on the bottom card goes into effect the player pictured will have to give up one of their cards since they have three building cards and two cards in their timeline. The calamity effect of the card at the bottom targets trade buildings first so this player will have to give up one of their trade buildings. 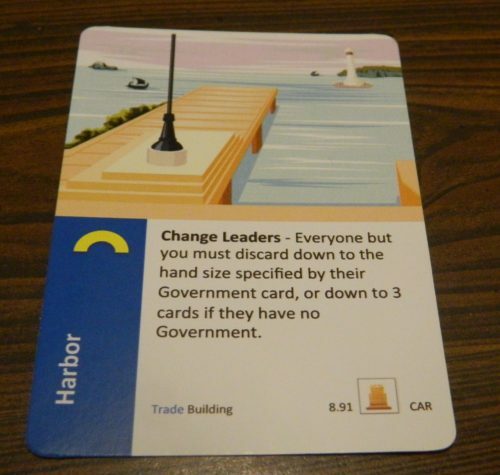 Change Leaders: Every player except for the player who played the card has to discard down to the number of cards printed on their current government card or down to three cards if they currently have no government. Supply Check: Every player except for the player who played the card must take a military building back into their hand if they have more military cards in front of them than trade cards. After a player has played cards (or chose not to play any cards), they will draw new cards from the top of the draw pile. Players draw one card plus an additional card for every three cards played in front of them. If a player ever draws the “Empire” card they must play it immediately and follow its’ instructions. After drawing cards play moves to the next player clockwise. Players continue playing cards until a player plays a card with two symbols on the left side of the card and meets that card’s victory conditions. Basically there are three different types of cards that you can win with. Wonder: Play a number of specific building cards in front of you. Statue: Play a specific number of cards of a specific type of resource in front of you. Technology: Play two specific technology cards in front of you. The top row shows the cards needed to win with a statue. The second row shows winning with a wonder. The bottom row shows winning with technology. Civscape as a whole is a pretty easy game to learn and play. Basically all you do is play and draw cards. There are a couple other mechanics but they are pretty easy to learn. I would probably classify Civscape as light to moderate on the difficulty scale. Most of the game’s rules are printed directly on the cards themselves. The hardest part of the game is just reading the text on the cards and interpreting what the card does. While I think the amount of text on the cards could be reduced (more on this later), the text makes the game pretty easy to pick up and play. Currently the game lists the length at 8-40 minutes and I think that is actually pretty accurate. Your first games may take a little more than 40 minutes as you adjust to the game but I don’t see games regularly lasting longer than 40 minutes. The reason that the game has such a large length range is that card draw luck can have a big role in how quick someone wins the game. If someone has really good card draw luck they could win in five to ten minutes. I would say the majority of games will take closer to forty minutes though as players generally won’t be lucky enough to run away with the victory and will instead battle against each other to make progress towards victory. One of the interesting things I found about Civscape is that while it is a civilization building game, I see it just as much as a civilization destruction game. I say this because while the goal is to build up your own civilization, it is just as important to destroy/wreck the other player’s civilizations. I was actually surprised by how much “take that” there is in Civscape. While I would have preferred a little less take that, it works pretty well for the game. The take that actually makes sense for the theme as cities in the time period were regularly fighting/destroying each other. The reason that the game has a lot of take that is that every card has some effect that applies when it is played. For example you will have to discard cards from your hand, remove cards that you have played, along with other effects. A lot of these effects are used for a risk/reward mechanic. For example if you have more timeline cards than building cards, you don’t really have to worry about losing buildings. You may want to take a risk though and play more buildings than cards to your timeline in order to get closer to victory. This strategy could backfire though if someone plays a card that makes you discard buildings. This risk/reward mechanic holds for a lot of the cards except for some of the event cards. Some of the event cards can be quite powerful if played at the right time. You can’t really protect against a lot of these cards either. Some of these event cards can be game changing as they could really hinder another player’s strategy. One of the keys to Civscape is to get a good government. Government cards are easily the most important cards in the game in my opinion. Government cards are key because they are important for maintaining your hand whenever a player activates the change leader effect. If you don’t have a government your hand will get reduced to three cards. The change leader effect is on a lot of cards which means that it is hard to build anything up if you have to keep discarding cards. 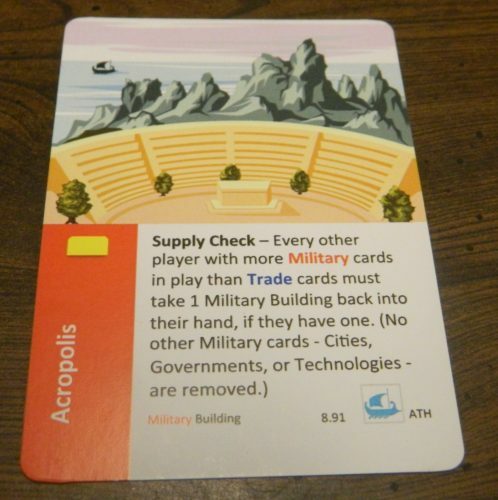 A player can get a big advantage in the game by having a good government card. Being able to keep ten cards in your hand while another player can only keep three cards gives you a really big advantage. While government cards are really powerful it makes sense thematically. If you are building a city it makes sense that your government is really important. Eventually everyone will get a decent government but if a player takes several turns to draw a government card they could fall pretty far behind the other players. As a whole I don’t mind that the government cards are so powerful. The one problem I have with the government cards though comes from the fact that too many cards have the change leader effect on them. Early in one game we were constantly having to discard cards since no one had a government card. I once had a whole hand of cards with every single card having the change leader effect which meant the other players were constantly discarding. I personally think this effect should be removed from some of the cards. 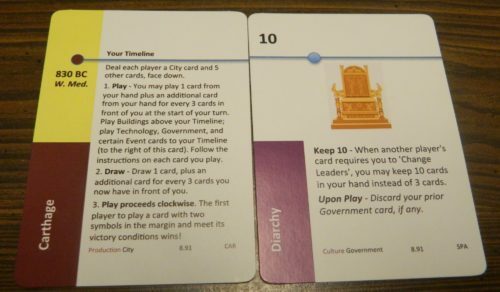 The other thing that I would suggest is that if a player ends up losing their government (due to a card played by another player) and they have another government card in their hand, they should be able to play it immediately to prevent losing some of their cards through a change leader effect. In one game I took advantage of this by getting rid of a player’s government and then using the change leader effect to force them to discard seven cards. This pretty much ruined that player’s strategy. While there is a lot of discarding in the game it is not a huge problem most of the time because you usually have quite a few cards that you have no use for so you can discard them easily. Another issue comes from there being a lot of text on the cards. Almost every card in the game has multiple sentences of text explaining the card’s effects. This kind of becomes a nuisance when you have to read through all of the text to just see what the card does. I don’t think all of the text is necessary on most of the cards. The text becomes less of a problem the more you play the game since you learn which areas you can skim through to find the information that you need. I think the game could benefit from using symbols or key words for the effects that are on a lot of cards though to cut down on some of the text. This might require you to reference the rules more during your first game but I think it would be beneficial once you get familiar with the game since it will make the cards easier to read. One thing I am a little worried about with the game is that there is the potential for a runaway leader problem. I haven’t encountered the issue yet as the games I played were pretty close. I worry a little about the issue though since the game is designed in a way that the more cards you have played, the more cards you get to play and draw on your turn. This means it will be easier to extend a lead over the other players. The game does have a decent amount of cards that can mess with the other players though so this could even out the playing field a little. Component wise I thought the game was pretty good. The cardstock is solid and the printing is pretty good. I liked the artwork quite a bit. With this review being based on a preview copy though, the quality of the final version could be a little different. The only problem that I had with the cards had to do with the amount of text on the cards. Some cards are mostly walls of text which means the artwork had to be made smaller than it should have been. Other than the amount of text, I thought the card design was really good. Overall Civscape is a fun interesting take on the civilization building genre. The game is pretty easy to learn and yet has a decent amount of strategy. The game has some interesting mechanics that work well with the game’s theme. I wish the game had a little less take that and less discarding though. The amount of text on the cards could be reduced a little as well. Otherwise I enjoyed my time with Civscape. If you really aren’t into the civilization building theme or are only interested in highly strategy games, Civscape probably won’t be for you. If you are looking for a light to medium card game with a civilization building theme though I think you will enjoy Civscape. If you would like to purchase Civscape you can currently find it on The Game Crafter. 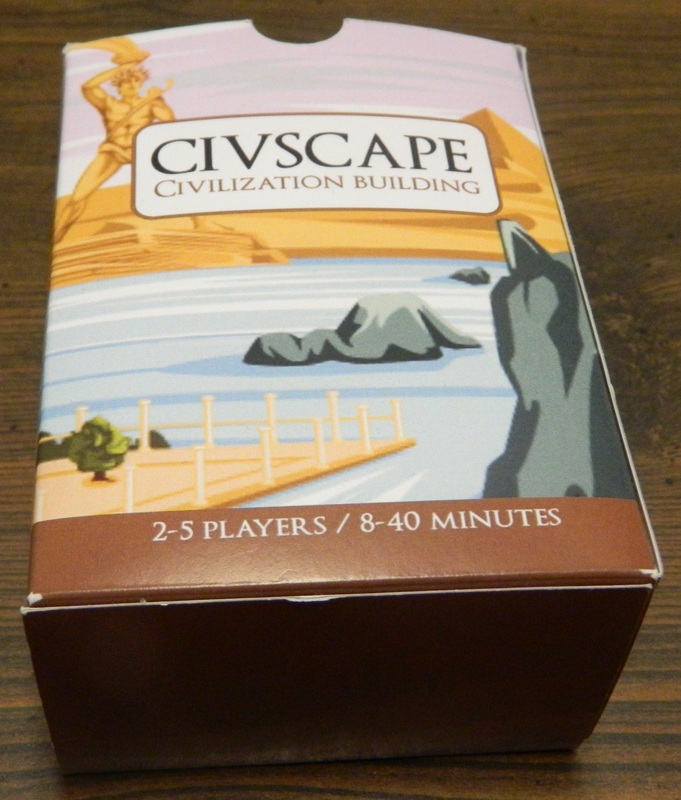 We would like to thank Jeffrey Henning for the preview copy of Civscape used for this review. Other than receiving the preview copy we at Geeky Hobbies received no other compensation for this review. This review is based on a pre-release version of the game so there could be small tweaks to the components for the final version of the game. Surprisingly easy and quick to play for a civilization building game. A little too much take that. Too much text on the cards.